You are here: Home / BUSINESS / Is the fear of appearing imperfect holding you back in your business? Is the fear of appearing imperfect holding you back in your business? In March last year, Professor Robert Kelly was in a live interview with the BBC when his children burst into the room, and his chaotic family life was broadcast around the globe. 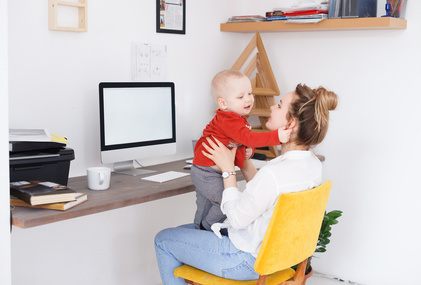 According to international business coach, Lauren Marie, the video reflects the messy reality of millions of parents who run a business from home – a messiness, sadly, that most Mumpreneurs feel pressured to hide from the world. Lauren’s main concern is that many Mumpreneurs ‘reduce’ what they think they can do, be or achieve, simply to keep up the appearance of being in control. “I always say to my clients, what if being a mum can allow you to create more, not less? Choose to create more with your business, and your life – especially if it doesn’t look perfect”, Lauren advises. Lauren Marie is a Joy of Business facilitator, acupuncturist, entrepreneur and mother of twins. She travels worldwide, facilitating classes and changing her clients’ point of view about life, health and business. Born on the outskirts of Washington D.C., Lauren now lives on Queensland’s Sunshine Coast. A passionate creator and conscious rule-breaker, Lauren seeks to inspire other mothers to see the possibilities others overlook and to embrace every challenge and choice that parenthood brings.